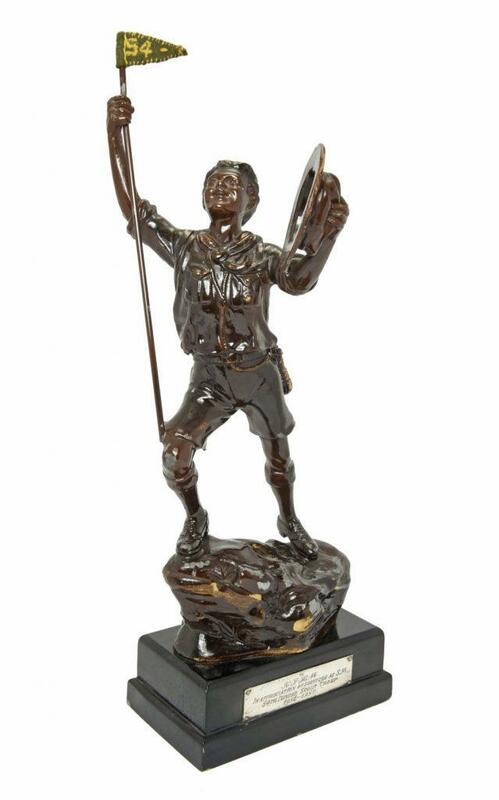 This statuette in cast aluminium alloy, varnished in brown and with gold highlights is one of several items donated to the Stirling Smith by the late Dr. Ken Mackay (1931-2014). Ken was a life-long Scout, and the trophy was presented to him for his services to the 54th Dundee Scout Troop, 1952-1957, as a Scout Leader, before his teaching career took him to Stirling. The statue is reputedly from a design by Scout founder Robert Baden Powell himself. Baden Powell was an accomplished artist who believed in drawing every day. The figure is probably by Hungarian sculptor Julius G. Maysch (1882-1946) who produced a similar iconic statue in 1930. There are dozens of Scouting statues and figures throughout the world, but this one is special. Its fabric pennant was sewn by a member of the 54th Dundee Troop. Ken Mackay was a much-loved teacher of science, both at the High School and the University of Stirling. He pioneered industrial archaeology, taking his pupils to record lime kilns and early industrial buildings. It is thanks to him that the Observatory Tower of the Stirling Highland Hotel (formerly the High School of Stirling) is functional, with a telescope for astronomy. It was disused for decades, before Ken and a team of his students dug out the pigeon droppings and restored the Observatory apparatus.